Lavish and Lime is a Canadian owned and operated online store specializing in contemporary eco-friendly products. They have managed to include a wide array of colourful, fun and quality products to suit your style of greener living. Remember my review of the Camelback Stainless Steel Water Bottle last October? Yeah, my daughter still uses it regularly which means it's rarely stored in the cupboards. 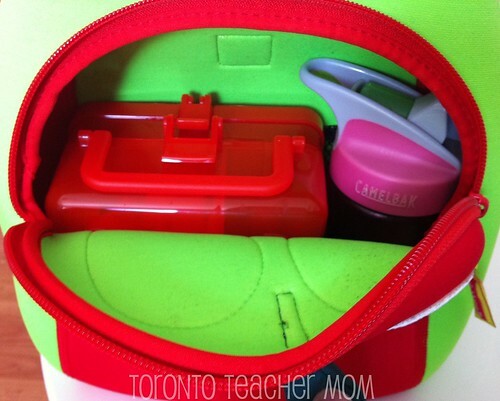 This year, my daughter will start grade one with a stylish new PVC-Free Neoprene-Like Apple Lunch Bag and a Non-Toxic Lunch Box Cube thanks to Lavish and Lime. When I first pulled out the apple lunch bag from the box, I instantly noted how bright the lime green colour is. And I mean bright! I think it might look better in a darker green but the good thing is my daughter will be able to spot her new lunch bag from a mile away. The design is really neat and I like how there's a built-in handle on top, zippered opening on one side a pocket on the other. The inside comes with handy mesh pockets to help secure smaller items like reusable napkins or cutlery. The fabric is flexible and strong, and is crafted from eco-sponge which has earned the rigorous Oeko-Tex 100 standard of safety in textiles. This means this lunch bag is free of PVC, lead, phthalates and over 100 other potentially harmful substances. This lunch bag also insulates and retains food temperatures. When it first came out of the box, it wouldn't sit upright without falling over but after a while it returned to its proper shape and sits very nicely. The best part is that it's machine washable, stain-resistant and built to last. We've already taken it with us on a couple of picnics to the neighbourhood park. It has plenty of room to fit the lunch box cube and a water bottle. The lunch box cube is a neat idea. You don't need individual tupperware because there are three compartments on the bottom and one large compartment on top, which is perfect for sandwiches. You might want to keep in mind, though, that if the top compartment is full, the cube might tilt backwards when you try to access the lower compartment. Also, the little compartment on the bottom near the back is not as easily accessible for adult fingers but my little ones had no problem reaching for their blueberries. All in all, it came in handy and it was so nice not to have to worry about separate lids and washing a bunch of tupperware afterwards. From a teacher's perspective, I would imagine it would be a lot easier to help younger students to open the lunch box cube than individual containers, and you won't have parents coming in the next day looking for missing lids. We took our Lunch Box Cube to Ontario Place. Twice. This contest has ended. 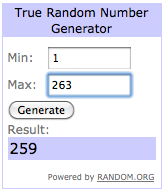 The winner has been announced below. One reader will win his/her own Apple Lunch Bag like the one featured in this review, courtesy of LavishandLime.com. For you first entry, which is mandatory, visit LavishandLime.com and browse through their products. Then come back here and leave a comment on this post with any other product that caught your eye, along with a way to contact you if you win. Become a fan of Lavish and Lime on Facebook for one entry. Become a follower of Lavish and Lime on Twitter. Add my blog button to your website for two entries. Contest ends September 7 at 10pm EST. Open to Canadian residents only. Winner will be selected using Random.org and must reply to the notification email within 48 hours or a new winner will be drawn. Thank you to Lavish and Lime for sponsoring this giveaway! Disclosure: I received product as mentioned in this post for the purpose of this review. I was not compensated in any other way. The thoughts and views expressed in this review are strictly my own honest opinions. follower of Lavish and Lime on Twitter. Love the sandwich wraps, reusable metal containers (glass concerns me if it's dropped), the lunch bags and the reusable water bottles. The designs are wonderful for kids and great for parents. No more remembering to buy bags and bottles of water (or juice, or whatever). I really like the look of the Double Walled Stainless Steel Tiffin Box - double! Its very futuristic! follow of Lavish and Lime on Twitter. I love the Envirosax Shopping Bag - sesame street 5-pack pouch. I "like" you on facebook as well as lavish and lime and subscribe to your email. I am a fan of lavish and lime on facebook. I like their Kids Lunch Box Kits - girls butterfly . I like the Envirosax Shopping Bag - big bird. I follow you on GFC as 'bigdisneyfan'. I like the CamelBak Kids Stainless Steel Bottles - butterflies pattern. Very cute! I would buy some reusable snack bags. I love the see through reusable baggies. I'm now a Facebook Fan of Lavish and Lime. I love the rainbow ants notebook! My insect-loving son would love it. I like the reusable water bottles! Would love to win the bag! So cute and I want to have one. Never seen that in any of the department stores in my country. The see through reusable baggies are great! I like L&L on FB! Love their website. I am coveting the envirosax and the new glass storage containers. I love their natural cosmetics, especially their Vapour Organic Beauty Elixir Plumping Lip Gloss. I like Lavish and Lime on facebook -- Jen Tam. I follow Lavish and Lime on twitter -- jentamar. Would LOVE the RuMe Baggies!! i am now a fan of lavish and lime on facebook!